My dad taught me how to make this soup and it was always one of my favorite meals growing up, and now I make it for my husband and it's one of his favorite things that I cook. 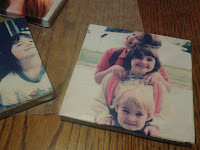 I made it yesterday so I thought I'd share it with you. It starts with a roux. That rhymes. one quart chicken broth (I always make sure to buy the kind without celery juice because I do not want my potato soup to taste like celery (yuck). 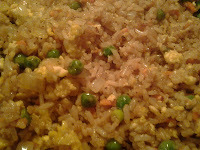 I only know how to cook for five people so this recipe makes a big pot. I start off potatoes! I use about 8 potatoes (10 if they are on the small side), and cut then into about 1/2 cubes and boil them in salted water until they are quite tender. Then take your chopped onion and a half stick off butter in a stock pot. 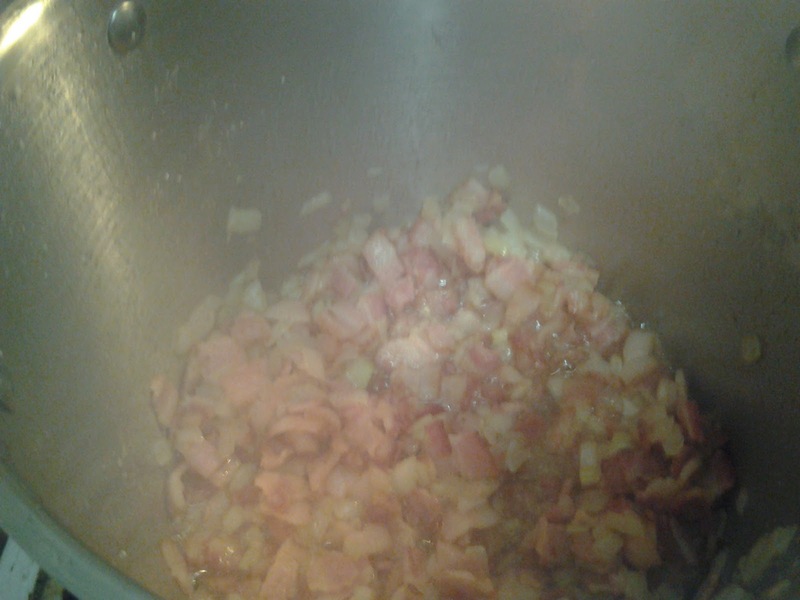 Cook on medium heat until the onions are clarified then add your bacon that has been cut up into small pieces. Now it's time to make your roux. A roux is a mixture of equal parts flour and fat so since we had 1/4 cup of butter and some of it is soaked up in the onions and some of it evaporated, I add about three tablespoons of flour to the onions and melted butter then mix it all up. Next add one quart of chicken broth. So stir it up really well making sure there are no flour lumps. 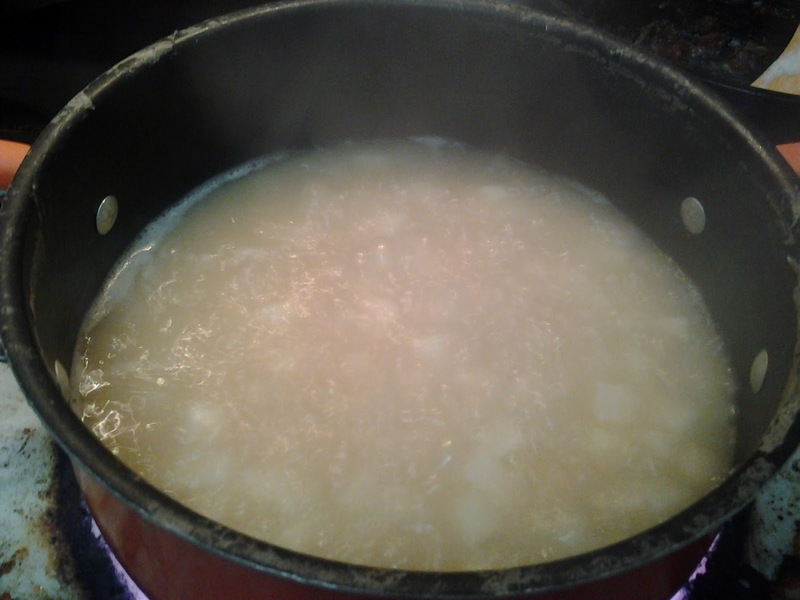 Now take your cooked potatoes that have been drained of all the water and add it to the broth mixture...and here is a good time to add a little salt and lots of black pepper. I have no idea how much I put in, but not too much at this point because you'll add cheese and worcestershire later which will add even more saltiness. You're going to cook the potatoes and broth for about 30 minutes over pretty low heat (stirring occasionaly of course) before you add the milk/half & half. 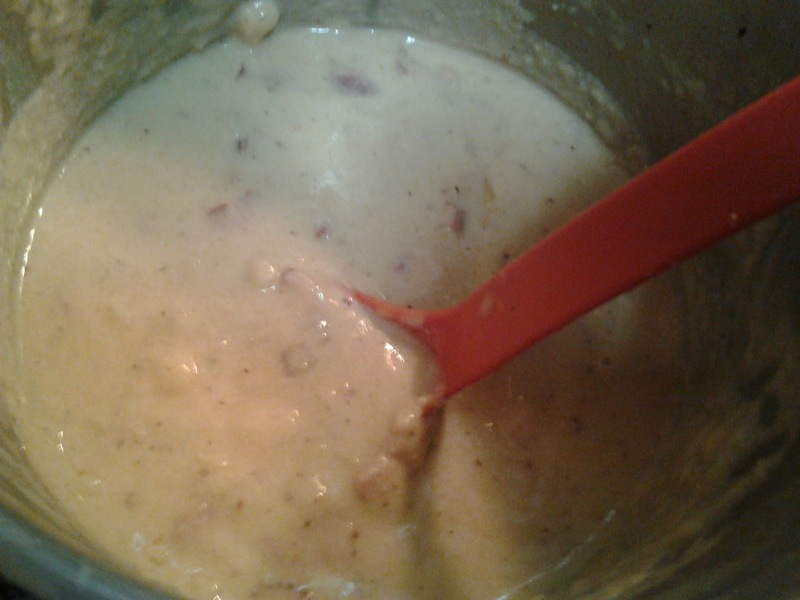 And before I do add the dairy I actually microwave it first so when I add it to the soup there will be no curdling. You don't need to heat it that long, just long enough so that it's no longer COLD. So add your warm milk and or half & half. 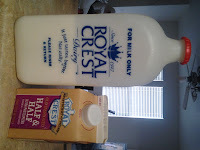 I use only half & half because it makes my soup really yummy and creamy. 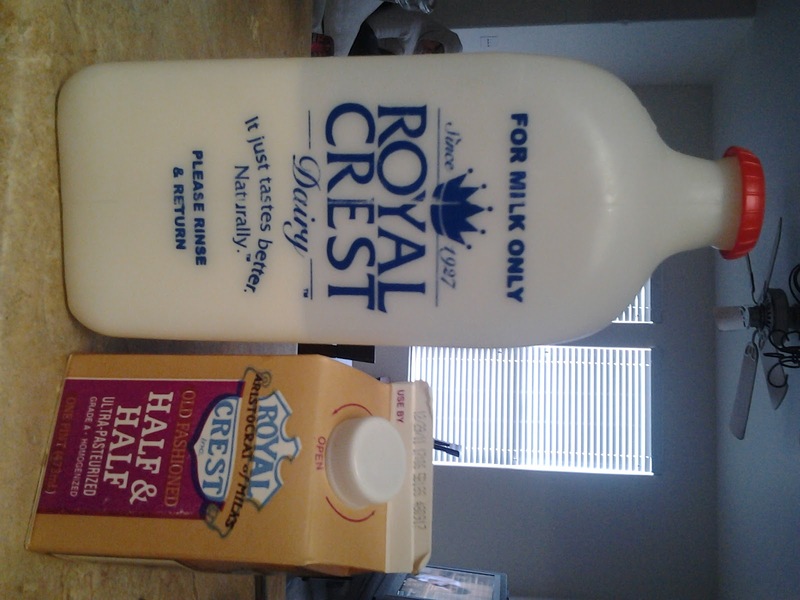 You can also use any kind of milk you like for fewer calories or add just a little half & half or cream. 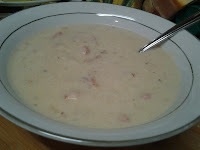 But remember that if you use only milk and especially fat free milk you soup will be will be runnier too. 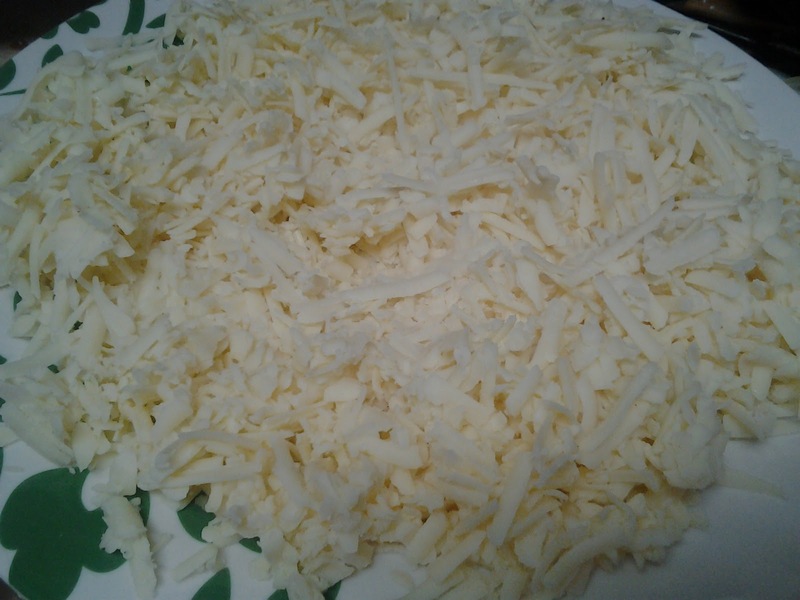 Continue to cook over low heat for about another 30 minutes and then it's time to add the cheese and my secret ingredient. Please please please use SHARP cheddar. Like my dad says, "What's the point of eating cheese if it doesn't smell like feet? "...or something to that effect. Our favorite brand to use is Cabot's because they have a great Extra Sharp Cheddar but then they have Seriously Sharp Cheddar which is just what this soup calls for. I like my potato soup cheeeesy! Also, just like we didn't want to add ice cold milk to steaming hot soup, we don't want to add cheese straight from the fridge to our soup because it can curdle and we want our soup to be smooth and creamy. 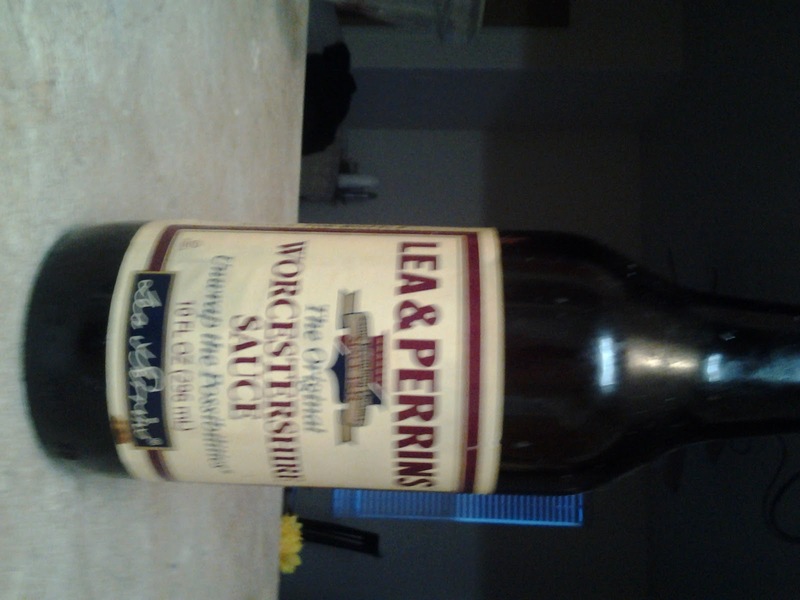 ﻿﻿﻿ ﻿Next up is the secret ingredient, WORCESTERSHIRE SAUCE. 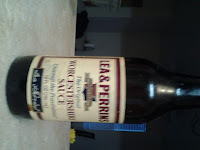 Please only use Lea & Perrins. I'd be frightening to try anything else. You can add about a teaspoon to a tablespoon but I probably use more because it adds the yummiest flavor. 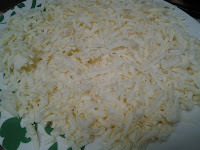 So once the cheese and worcestershire are added stir it up until the cheese it all melted then cook it for just about five more minutes. Taste your soup to see if it needs any more salt and pepper then add if needed. Your soup is done! 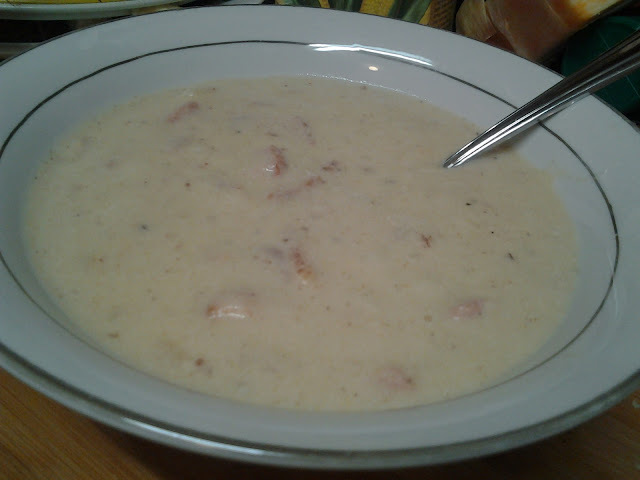 my pot of finished (and half-eaten) potato soup! Then take your corn bread out of the oven. Oh, did I not tell you that corn bread goes perfectly with potato soup? 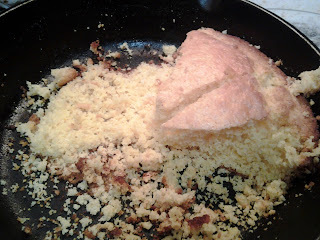 I only use Jiffy corn bread mix and I only bake it in a hot iron skillet that has been coated in bacon grease.